We are excited to be Virtually Connecting at the conference for Higher Education Research and Development Society of Australasia (Perth, Australia). The event takes place July 4-7 on the Australian Western Standard timezone (AWST). It’s been a bit of a rush with one onsite buddy handing in her PhD thesis this last week and the other onsite buddy being new to this caper. It’s fantastic that we have the conference executive committee behind our choice to connect. If you can’t make it to Australia, you’re in luck because we have a team of onsite buddies (Rosie Nash and Karen Miller) and virtual buddy (Wendy Taleo) who will be connecting you to the conference and keynote speaker and other participants. The Virtually Connecting Hangouts are open to up to 8 participants to join. 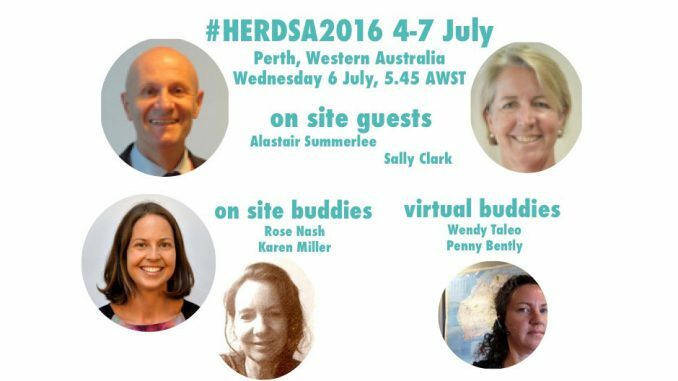 Don’t forget to follow the official tag #HERDSA2016 hashtag and participate to stay engaged. The session is spontaneous in nature and can run a few minutes early or a few minutes late.